Thought I could exit quietly as Chair of the Amherst Public Arts Commission, but it seems my committee had other ideas. Public Arts Commission would like to bring attention to the work I've done over the last 9 years and invite everyone to join us in June,to Kendrick Park at the sculpture, which was installed the first Amherst Biennial '10. So come join us, rain or shine (tents will be provided). Bring your frisbee's (Ultimate Frisbee started here didn't it? ), we will provide lemonade and cookies. Come celebrate the Art in the Park, my work and this wonderful diverse community. Help us reach our goal and support the arts programs of the Public Arts Commission. 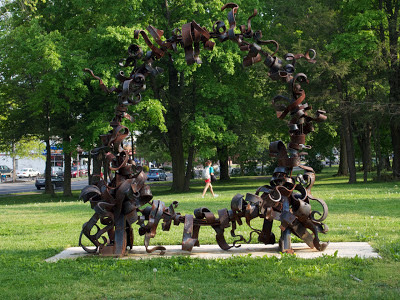 Meet you at Matt's sculpture in Kendrick Park, Amherst (across from Bertucci's - Sunday, June 30 @ 2PM. See you there.